Self-help gurus and sports coaches often recommend identifying your goals and then repeating them out loud, visualising yourself achieving them, sharing them with others, even tattooing them on to your skin. It's advice worth considering when you're planning and talking about what your organisation is trying to achieve through digital communication. In my last job, we used to endlessly repeat the mantra listen, publish, engage, evaluate to describe the method of digital diplomacy. Whether or not you agree with the headings, it was a handy and fairly memorable way to explain how the digital team could help diplomats. And the act of endlessly repeating it - in training courses, meetings and online - reinforced the message amongst the team, making it more likely that the day-to-day work followed a rigorous and consistent method. Which is about making sure we have the channels, platforms and processes that we need in place, and that we organise ourselves in a way that makes it possible to do some of the more ambitious things that we want to do. 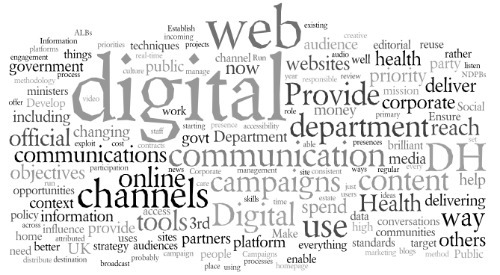 Which is about treating the highest priorities for the Department as the highest priorities for the digital communication team, and developing a repeatable method for applying digital communication tools and techniques. Which is about making sure that we have the skills we need in the digital communication teams, but also that these skills are mainstreamed, so that effective digital communication becomes part of the routine work of the Department. I'm not going to get the tattoo. But I will post more in the next few weeks about the work we're doing in each of these 3 areas.